When you have Classic Custom Builders construct your new, custom home in Northern Colorado, not only will you be gaining a forever home that matches your personality, but one that helps the environment and your wallet as well. In the last post, we gave you a few examples of how your decision to go with a new construction home over moving into a previously occupied one has already put you on the “green” path. This included better insulation and overall materials, new appliances, and windows built to keep in the heat or the cool air. In this blog, we’ll give you a few options to consider during the build that will further help you conserve energy which will help you live comfortably while also cutting down on costly utility bills. One thing that our customers’ love about the build process, is that it truly is custom. We firmly believe that you should be involved with decisions every step of the way. We won’t be moving in, you will! So our goal is to ensure that we are truly building your dream home. This includes the lot in which you’d like to live. This is fully up to you (although if you have no idea, we can help guide you), but when speaking about energy efficiency, we’re not strictly talking about the lot, but the placement of your custom home. You’re going to want to take into consideration that while you will, of course, want the sun’s warm rays to help warm you in the winter, but won’t want to be overexposed to it during the hot summer months. With simple adjustments in design and direction, we’ll help you get the best of both worlds so that you’re not blasting the air conditioning during the summer, or turning the heat up in the winter. Through advancements in technology, you can help reduce unnecessary energy usage through your thermostat itself! New programmable thermostats that stop or start running when necessary. This will help you ensure that your home is always at the desired temperature, without having to keep adjusting it. In fact, many new appliances have features that help you with higher energy efficiency. 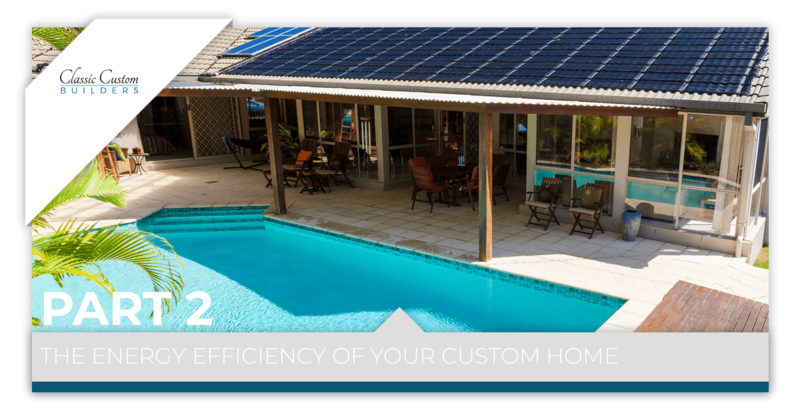 If you really want to take your energy conservation to the next level, there are many options for renewable energy sources that we can have installed on your new custom home. Solar panels can vastly cut your energy costs because you’re producing your own electricity! You also have multiple other source alternatives such as wind generators. If you’re looking to truly go “green”, just tell us in the initial phases of the build and we’ll turn your dream into a reality. While we discussed the improvement of windows and their insulation in the last post, you’re also going to want to consider where to have them in your home, as well as invest in good shades or blinds. Remember to consider solar gain, and have your windows strategically placed where it won’t heat your home and require you to use your AC more than you need to. But maybe you like the sun streaming through your windows. That’s okay! Once again, this is your home. Just be sure to get some high-quality shades to keep your home cool. While there are countless other ways to reduce your energy usages such as landscaping and lighting, we’ll be able to discuss this in great detail while we build your luxury custom home in Northern Colorado. If you’re ready to start building your dream home, or have any questions about our process, be sure to contact us today!